In 1682 Edmond Halley, an English astronomer, mathematician and scientist computed the orbit of the comet that appeared in the sky that year. He used the celestial mechanics of Sir Isaac Newton to calculate the orbit of the comet, and to determine that the same comet had previously appeared in 1531 and 1607. He predicted that it would reappear in 1758. It did, and the comet was named for Halley. Further investigation has shown that there are records of its appearance about every 76 years for 2000 years. The stamps that follow show pre-twentieth century representations of the comet. 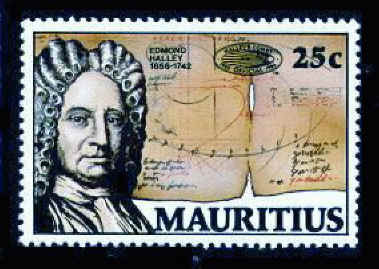 This stamp shows some of Halley's notes concerning the orbit of the comet. The idea for this collection came from Fire and Ice: A History of Comets in Art by Roberta J. M. Olson, Walker and Co., 1985.